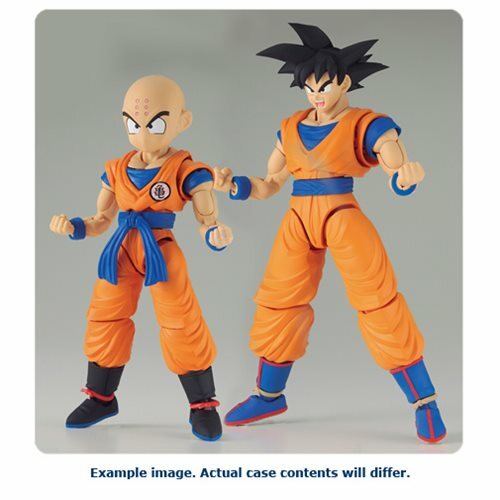 A special color variant of the Figure-rise Standard Son Goku and Krillin is here! Catch the two characters in the heat of battle as they power up to launch their attacks! The Dragon Ball Z Son Goku and Krillin Deluxe Set Figure-Rise Standard Model Kit includes action base, 4x joint parts, effect joint part, Kamehame effect part, 3x Son Goku expression parts, 5x hard parts for Goku, attack effect parts blast and Destructo disc. Also includes Krillin expression parts, and 6x hand parts for Krillin, 13x runner, 2x sticker sheet, and instruction manual. Ages 15 and up.